Shooting a historical movie can be an exciting experience. The historical costumes, locations, and settings often seem to take not only the viewer, but also the entire production team back in time. Steve Liu had such an experience on the Chinese production “Hidden Man”, on which he worked as a DIT supervisor. Set in the 1937 Beijing, the movie – which was recently screened at the Toronto International Film Festival – gives a lot of insights into the old Republic of China at the time. In a recent interview Steve shares some details on his work on this production, and explains how his team used Silverstack and LiveGrade Pro to handle the sometimes quite challenging circumstances on et. Thank you for agreeing to this interview. To start off, could you give us a short introduction of yourself? My name is Steve Liu. I am based in Beijing, China. Back in 2015 my partner Jason Zen and me founded the first full DIT workflow service company in China, SJ-WORKS. “SJ” stands for Steve and Jason — quite easy to remember. Within the last years our company has done a lot of major native films, as well as co-productions overseas. Our first big project was “The Great Wall”, for which we supplied the full DIT workflow, including live grading, QTake, Video Assist, and DMT. 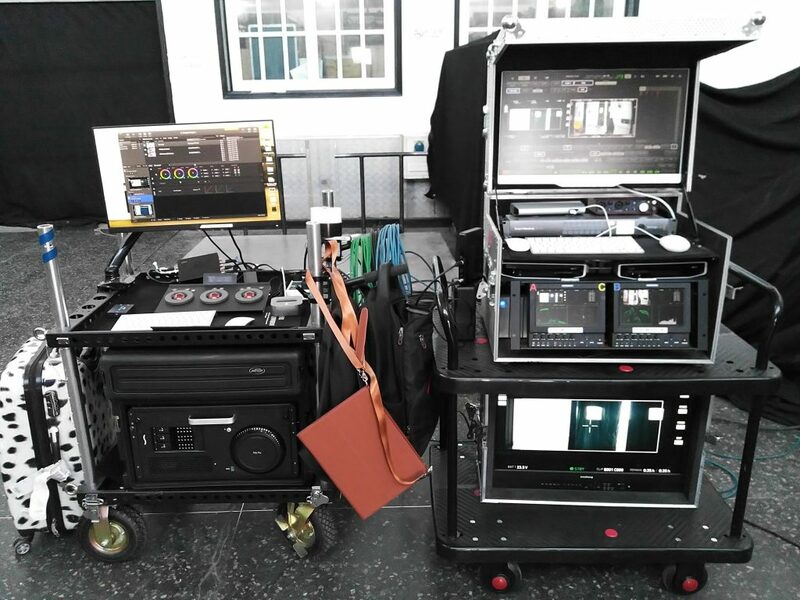 My experience of working in a camera rental house with a 3D Stereography supervisor, combined with Jason’s experience with 3D Stereography film editing, came in very handy when we built up SJ-WORKS. Today SJ-WORKS is known as a professional DIT platform. We design the workflow and supply the operators and equipments to execute the projects. You’ve recently worked on the feature film “Hidden Man”. Can you tell us a bit about this production? How did the team come together, and what was your role for the project? “Hidden Man” was directed by Jiang Wen, the cinematographer was XieXie. Director Jiang Wen is known for his great professional intelligence in the Chinese Film Industry, so he is one of our favorite directors to work with. After a long bidding process for this production, we were happy to win the project. Our company ended up supplying live grading, video assist, and DMT positions. Myself and Jason were the DIT supervisors of this film. In total, we had 5 people in our crew for this production. Can you tell us a bit about the project itself? How long was shooting and what were the main locations? 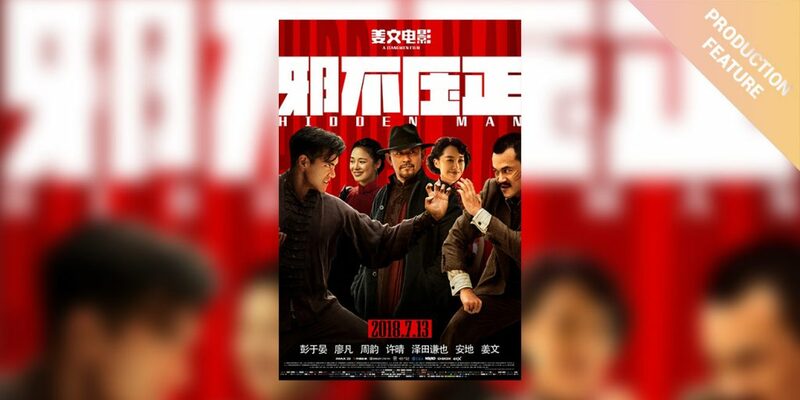 The movie is an adaption from the novel “Hidden Man”, written by Zhang Beihai. The movie is an action war film about the old Republic of China in 1937, and the struggle with Japan at that time. The major shooting locations were all over Beijing, as well as the Stone Forrest in Yunnan Province, Xi’An City, and some studio sets. As the 3rd and last film of the “The Republic China Trilogy” (Let the Bullet Fly, Gone with The Bullet, Hidden Man), it is considered to be the most expected film in China in 2018. From December 2017 until the summer of 2018, we spent almost half a year shooting this film. I the the movie itself is very fascinating. It’s a “Hamlet” style revenge story mixed with love, romance, action, black humor, and of course politics. I would absolutely recommend it to audiences that are interested in the Chinese history. How was production generally like? 1. “Hidden Man” was clearly the director’s film. Most of us didn’t even have the chance to read the script. Only very few people saw the script, and the final page of the script actually never existed until the film premiered. The script writers always worked directly with the director on set. Everything could be changed during the shoot. 2. As we were shooting mainly on location, many things were done spontaneously. We would never know the entire situation of the sets we were going to. We would never know what was waiting for us on the locations. This fact combined with the incredibly fast pace that the crew changed into as soon as shooting started meant we constantly had to be on our toes. We had to quickly react and find solutions to all the challenges on set, such as the constantly changing sunlight, the script changes, the 360° Trinity camera movements, and ultimately also the high pressure of the director. 3. The Chinese film industry is quite different from the western film industry, even for major local productions. The whole crew, and especially the DIT department, always has to do extra work behind the stage in order to minimize potential troubles later on. I don’t mean this negatively, but it’s just a different style of working. It’s definitely a challenge to find the balance between local productions and co-productions – especially for someone like me, who came back to China from film education in North America. During the shoot you worked with LiveGrade Pro and Silverstack XT. Were there any specific requirements for using the two software products on this production? Since we worked in the co-production film “The Great Wall”, LiveGrade Pro is highly required from western DoPs. And Silverstack is the major offloading tool we use on most of the films. As for specific requirements, the DP of Hidden Man, XieXie, was very clear and specific about what he needed for exposure control and framing. LiveGrade Pro was the best tool to meet his requirements – it’s easy and powerful. As for Silverstack, it’s a very smart data management tool that just made our lives easier with its well-designed offload process. Often while we were in the middle of loading a card, we had to pack up everything into the truck and move to the next location. In this case we could just pause and restart the copy process, so we never had any problems. What hardware equipment was used on the production? For LiveGrade Pro we have an individual hardware system to work with. It has a 15’’ Macbook Pro, FSI BoxIO, FSI CM250 monitor, and a Leader waveform monitor to feed in the signal from the ARRI Alexa. 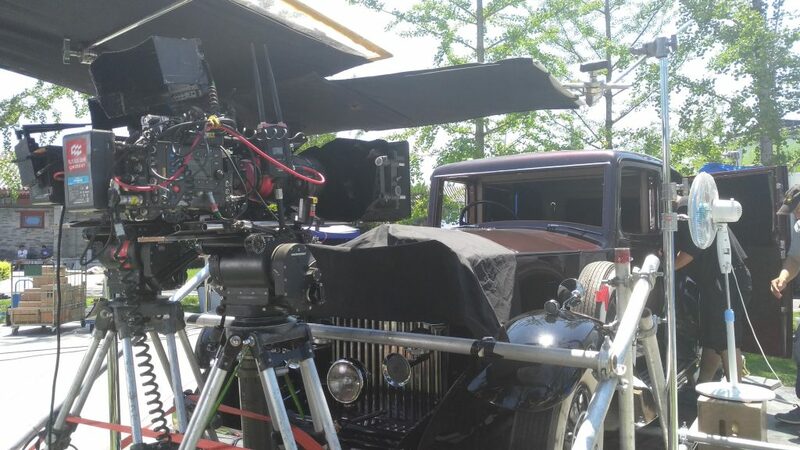 As for cameras, there were three cameras on set most of the time: Two ARRI Alexa SXTs, and one ARRI Mini camera. What we like about the ARRI Alexa SXT is that it has three individual SDI ports. One usually for the camera operator, one for the focus puller, and the last one exports Log-C to our LiveGrade Pro system. We had one onset grading operator to communicate with the 2nd AC about the proper T-stop exposure and check the waveform monitor. 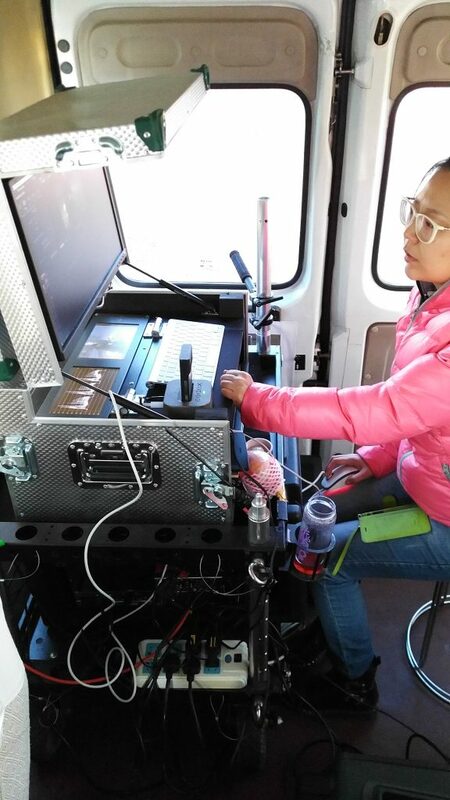 The SDI signal was then exported to the Qtake video assist system with all the grading information. How was collaboration between the set and post production? As we had a lot of VFX shots in the film, the metadata was extremely important for post production. That’s why the Silverstack reports, that contain a lot of metadata, came in very handy for the VFX and DI department. One challenge we had on set was the exposure. As we had quite a lot of night scenes, the exposure often was very low. That’s why to see more details in the shadows, we switched from an OLED monitor to the FSI AM210 LCD, that was perfect for the low light exposure that we had. The AM210 LCD was actually mounted on a C-Stand, so it could move with the director together, who followed all the action on the monitor. The DI was done by Digital Domain PO China. We delivered all the footage to D.D.P.O. to their IO department and constantly were in communication with their DI crew about the situation on-set, and why certain scenes were shot the way they are. How was your overall color and data management workflow like? Were there any features that stood out? Put ARRI LCC LUT on Log-C from camera: As we had many night scenes on location, we did a lot of tests with DP XieXie to figure out the best way to control the exposure in different situations. We figured that LCC would be the best way to begin with. Color Matching and Correction: We had three ARRI cameras, all of them with different lenses that generated different colors. We color matched all lenses with a first light grading to balance the images. Then we exported the CDL files for the DIT, so he could do more accurate color grading when transcoding. Offloading footage: On this production we didn’t have enough SSD cards by far for some reasons. That’s why we had to use every SSD card at least twice or three times per day, so offloading clips into the storage had the highest priority. We always offloaded the footage to one SSD Raid, and if time allowed did a cascading copy to three other external hard drives. In the end it really felt like a racing competition with the camera department. If we were “too slow” and ran out of cards, the entire crew would have to wait for the DIT to finish offloading. Transcoding: We transcoded the RAW footage to Avid DNxHD in DaVinci Resolve. The LUTs from LiveGrade Pro and QTake were put into the ARRI RAW files for accurate color grading and color balance. We then delivered all the editorial by hard drive to the editor every end of the day or in the morning the next day. Backups: The DIT department needed to keep working in the hotel after everyone left. We then used Silverstack to define the pipeline of tasks and schedule all backups, so that the machine could work the whole night and the DIT could go to sleep. As the crew call was always very early, we had a few times when the backups were just finished before the crew was ready to go again. Was there a particularly challenging setup for Silverstack or LiveGrade Pro on this production? Yes, actually we had one emergency situation once with the offload of cards: When DJI China came to shoot with a drone carrying an Alexa Mini, each CFast card could only shoot about 10 minutes. As soon as the drone landed, the DJI team just replaced the batteries, while our data wrangler went to exchange the CFast card. Then the drone immediately started again. The data wrangler ran to the system and began offloading the new card. After 5 minutes, the crew came back with the drone and the same process started again. Using the MD5 checksum, one card took about 15-20 min offloading, so we had 4 cards in the run. At the end of the day, each card had been used about twice by the team. We are happy to say that the production never had to stop because of us! When you think back to this production, what would be the “one thing” that you remember? The one thing I will always remember of Hidden Man was a hot summer afternoon, when we shot in the ‘Drum and Bell Tower’. The tower is located on the centre axis of Beijing city. There are still a lot of old local Beijing citizens living in the old Quadrangle houses there, so the area has a very historical feeling to it. After a long rehearsal the actor, Eddie Peng, and Director, Jiang Wen, began to do costume and make up. 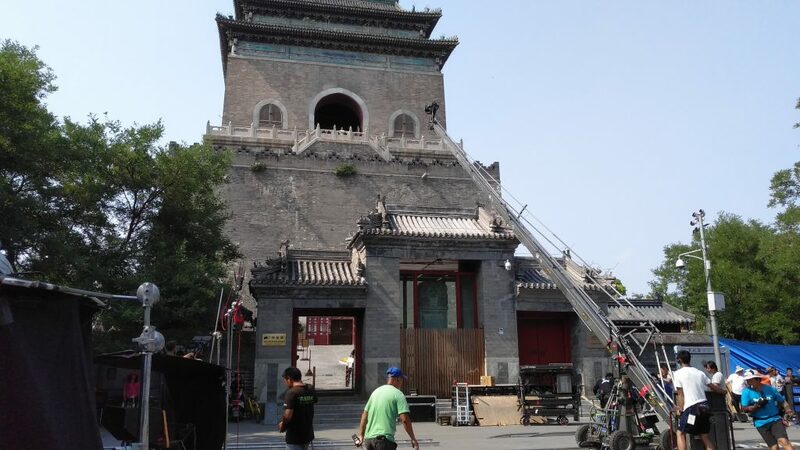 During the waiting time everyone was preparing for the shoot: The camera team was checking the lens, the grip team was moving the crane, the producers were chatting with each other, tourists stopped by and took pictures. The hot and lazy afternoon sun light shined on everybody’s face. Suddenly there was a deep voice coming from the RV, and director Jiang Wen, who held a cigar and wore an old hat, walked out of the car. The actor wore a black Kung-Fu blouse with round, old-school sun glasses. Holding a black umbrella, he passed in front of me. Followed by Director Jiang Wen, the two walked towards the Clock Tower. After climbing the many stairs of the Tower, they appeared on top of the tower. The 1st AD shouted “quiet on-set”, the camera AC plugged the SDI cable, fed out the Log-C signal, our LiveGrade colorist put the LCC LUT on, and the magic came out with the 4pm sunshine. Many thanks to Steve for sharing these very interesting insights into the production of Hidden Man! 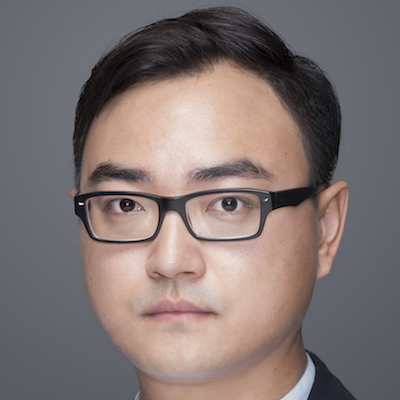 Steve Liu is one of two owners of SJ-WORKS, the first full DIT services company in China. After spending many years working in the film industry in North America, Steve returned to Beijing and founded the company with his partner Jason. Today the company is known as a DIT platform, providing everything from workflow planning to operators executing the projects. 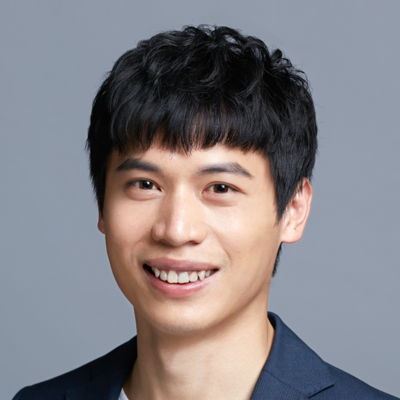 Jason founded the company SJ-WORKS together with Steve, utilizing his experience from 3D Stereography film editing.